For those of you who are familiar with Asian food, I’m sure you’d know what Nasi Lemak is. It’s actually a Malay dish which literally translates into ‘rice in cream’. 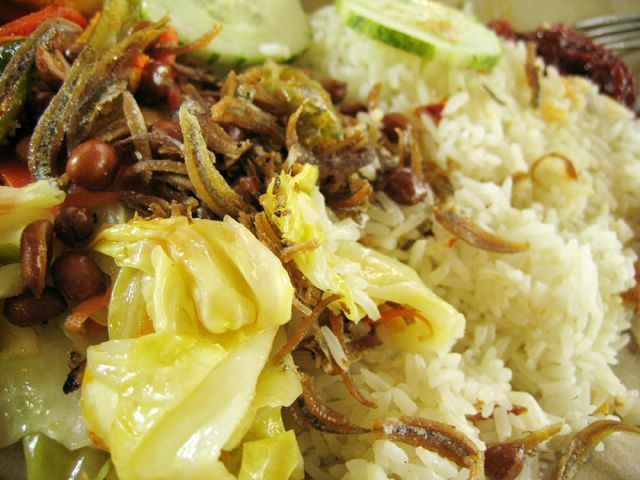 Nasi means rice and Lemak refers to the coconut milk used to flavour the rice. You must be wondering what’s the deal about the rice? Well for starters, it might look rather ordinary but hey you know how much work goes into ensuring it retains it’s flavour when cooked in coconut milk? I like my Nasi Lemak rice to be tasty and yet not too oily till it overpowers the other dishes. The thing about Nasi Lemak isn’t so much the sum of it’s other accompainments but rather, the power of the rice itself. I kid you not. It isn’t a complicated dish I promise you. Rather easy to put together, it’s child’s play for some. For me, I have yet to attempt cooking this dish so I just make do with the ones I consume outside. I didn’t copy down the address but it’s quite easy to spot, this stall. It’s at the Holland Village Hawker Centre. The one facing the main road. Just a few stores to the left of the soya bean milk stall. I know a good Nasi Lemak when i taste one and this is one of it! I know it might not be as well known as the one at Chong Pang but hey, at least they know they’re doing this for the benefit of those daring enough to try others. People like me for instance. haha i love trying out new places and stalls I’ve heard about. I was just reading through your blog, and you made me miss Singaporean food so much, even though I’ve only been away from home for three months. Holland V is near where I live (I’ll be home next week!) and I’ll definitely try it out. Good luck with your online bakery! Literal translation of “Lemak” in malay is (rich and creamy). Love your blog! Keep it up! Actually lemak means fat/oil and it refers to the coconut milk used to cook the rice with. Hi, I enjoy your foodblog very much! just wanted to let you know that I just visited Miss Clarity Cafe on your recommendation! It was good! A little salty for my taste, but yummy anyway. And the desserts were mmm-mmmm. actually, the original stall is down the street towards the 2 storey carpark, couple of shops from Subway. I think there’re more choices for the dishes and that’s where the famous Holland V Laksa is as well. I go there so frequent that it’s the norm for me already. Heh….